The London designer has made her name creating elegantly understated interiors that are rooted in history even as they embrace the present. 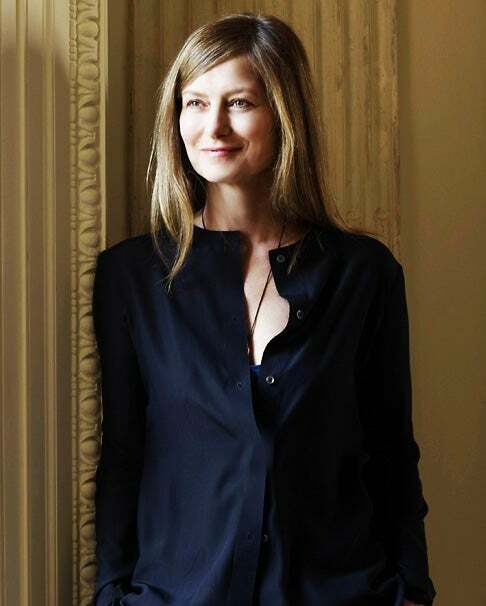 Designer Rose Uniacke’s inner sanctum is elegantly simple — white-painted brick walls, deep book shelves, thick rush matting and paintings by Olafur Eliasson. 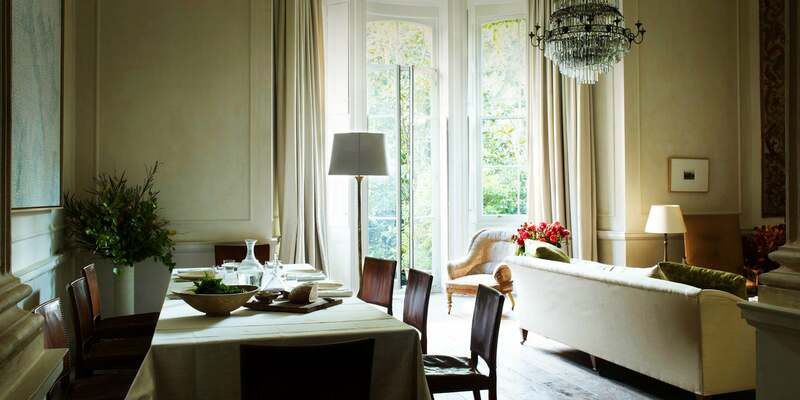 From this space, Uniacke oversees the three strands of her business: designing interiors, dealing in antiques and creating her own covetable ranges of furniture, accessories and lighting. (Her own Hoof Standard lamp stands sentry at the door to her office.) Uniacke herself is tall, slim and engagingly attractive, a natural beauty with an infectious laugh. She is also the epitome of discretion: “I would hate my clients to recognize their homes in what I say,” she says. Over the last five years, she has ascended to the upper echelons of London’s interior designing elite, going from well-kept secret to household name in what seemed like a heartbeat, and today, she counts both the residences of discerning private clients and the offices of savvy brands among her projects. Jo Malone’s flagship London headquarters is a case in point. The definition of subtle luxury, it pays subtle homage to the 18th-century grandeur of the townhouse in which the offices are located. Pale walls, bare boards, simple window treatments and neutral upholstery provide the foundation for a few well chosen pieces, such as the fabulous tole oak-leaf chandelier in the drawing-room, a space used both for large meetings and intimate lunches, and the pair of Art Deco highboys in another of the conference rooms. A custom-made oak-leaf chandelier hangs from the ceiling of the drawing room at the Jo Malone headquarters, in London. 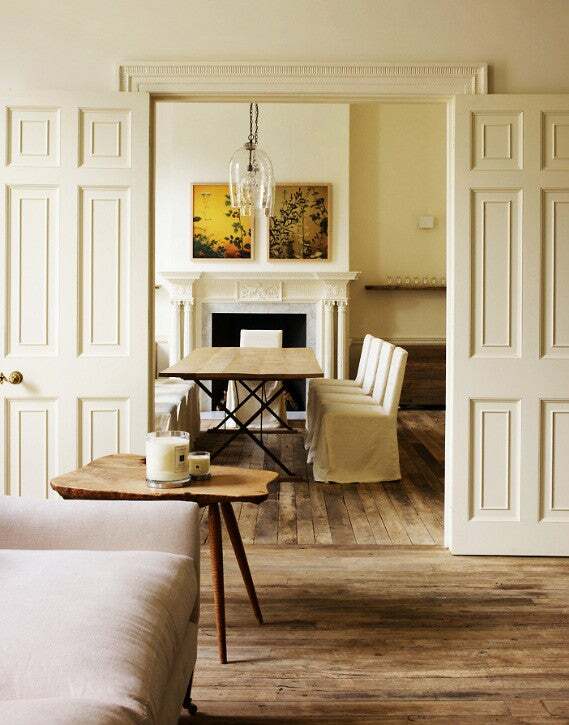 Uniacke designed the Jo Malone offices in an 18th-century townhouse; this view looks from the drawing room to the study. She is also a connoisseur of patina, whether in the walnut of a Roman refectory table, the ebony and ormolu of a high Regency sofa or the distressed leather of a rare pair of Frits Henningsen armchairs from the ’50s. “I do like texture to be very strong,” she says. “I would prefer to have one fabulous piece of furniture rather than walls covered in something highly decorative.” As you might expect, her shop is a series of refined, light-flooded rooms, with signature bare boards and white walls, a vision of pared-down elegance. In essence, it is a direct reflection of what makes Uniacke tick, the perfect bait with which to entice those who hanker for the same intelligently restrained style. 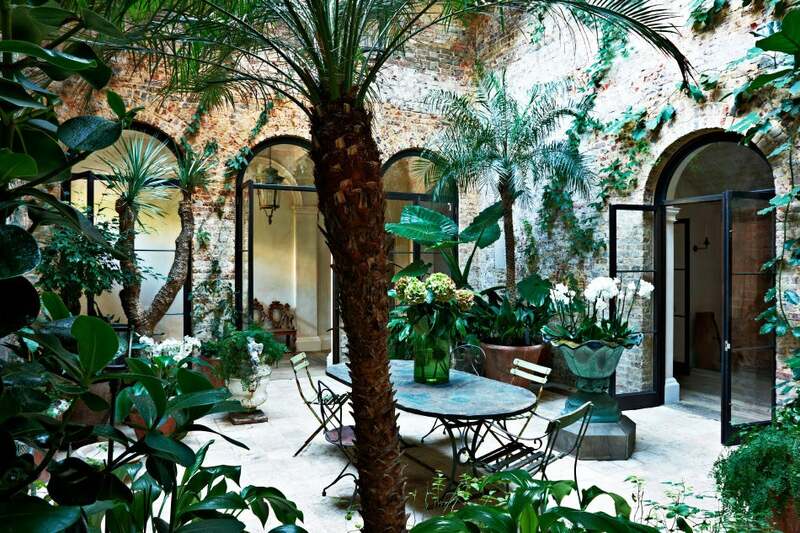 The designer’s London home opens onto several internal garden spaces. 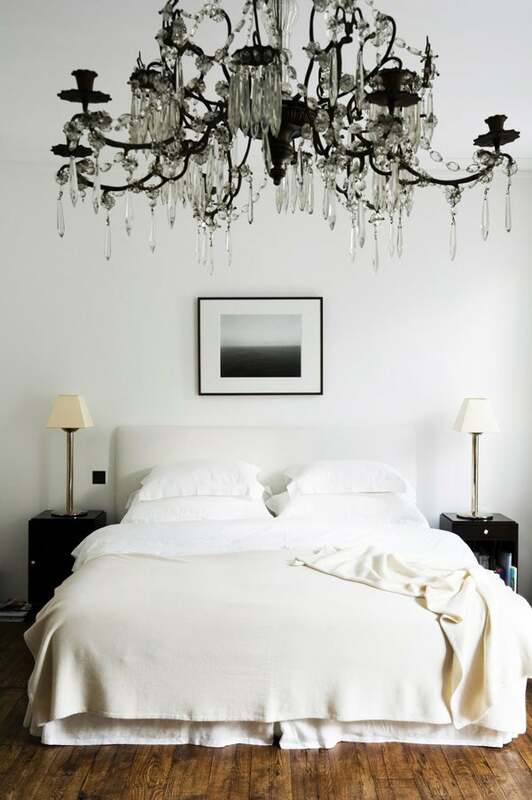 A grand chandelier adds glamour to the otherwise low-key bedroom of a London house. By 24 she was married to financier Robie Uniacke. They bought their first house in South London’s Clapham neighborhood in the late ’80s, and Uniacke remembers water-gilding the whole stair rail. “Completely crazy but also beautiful,” she says now. 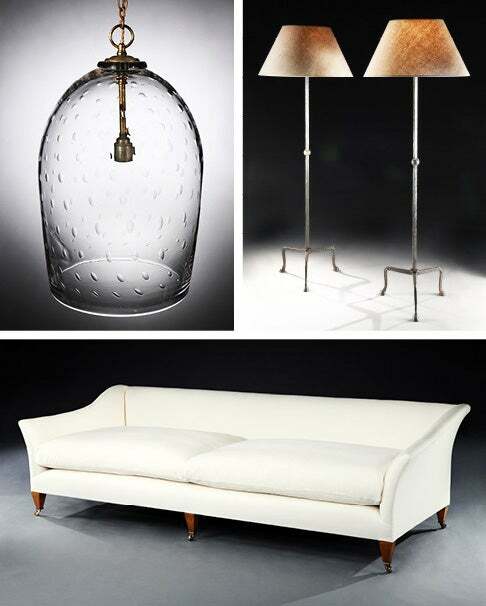 Uniacke’s furniture and lighting designs include, from top left, the Bubble Glass lantern, Hoof lamp and Drawing Room sofa. Among her most recent designs are the hand-blown Bubble Glass lantern, the oak-topped Drapers table and the Hoof lamps seen in her studio. The lamp’s hoof feet are her own witty touch to designs that are classically inspired but lean toward the contemporary. 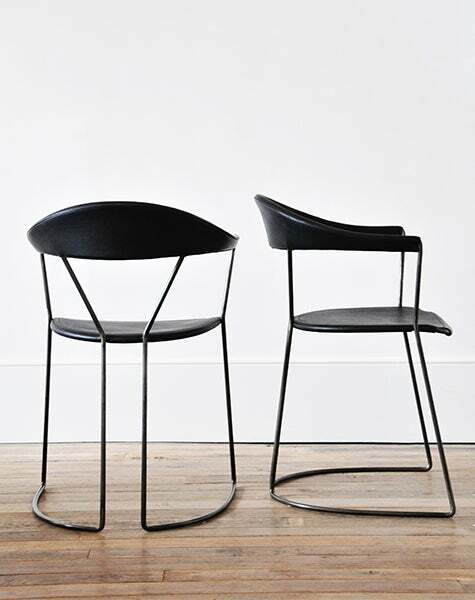 She produces the furniture and lighting mainly in Britain, part of her commitment to support traditional craft techniques and keep small ateliers in business. 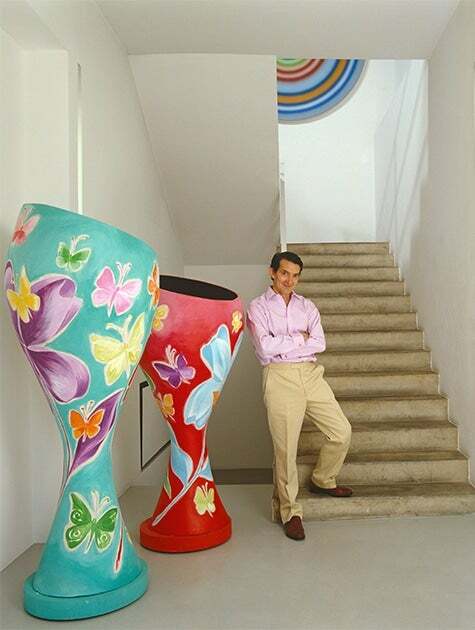 Many of these pieces were originally designed for her own home, a short walk from the shop. She and Heyman bought it in 2007 and spent the next three years transforming it from a run-down warren of flats and offices into a stunning family residence. Built by the Victorian society portrait painter James Rannie Swinton, it includes Swinton’s octagonal studio, now converted into the couple’s study. Following Swinton’s death, the building became the Grosvenor School of Art in 1925. Left: A vignette in the corner of Uniacke’s study shows off a Sigmar Polke painting, Børge Mogensen chairs and an early Mughal carpet. Right: Like the rest of the Jo Malone spaces, the reception room feels residential. It was a fun project,” Uniacke says, “but it was a challenge to take such a cavernous space and turn it into a comfortable home.” This she has successfully done by combining her almost monastic taste for pale walls and unfinished wood floors with simple but luxurious touches — the 17th-century Mughal rug in the study, say, or the sumptuous mix of fabrics (Fortuny is a particular love) and, of course, exceptional antiques, including a rare octagon-shaped Regency partners’ desk. The pièce de résistance, however, is the 12-ton stone cantilevered staircase, which had been removed at some point in the building’s colorful history and which Uniacke had rebuilt and reinstalled just as the house’s original architect intended. If her younger self could see how her life has turned out, Uniacke thinks she would simply not believe it. “It never crossed my mind to do up people’s houses,” she says. “Everything that has happened has just been a response to certain situations.” Some would describe what she has achieved as a mini-empire, but she will have none of it. “It is just a corner shop really,” she protests with the kind of understated elegance that is at the heart of her success. Every September, London becomes designed obsessed. Our guide describes some of this year’s most exciting events and creative interventions at the London Design Festival, leading museums, local galleries and more. 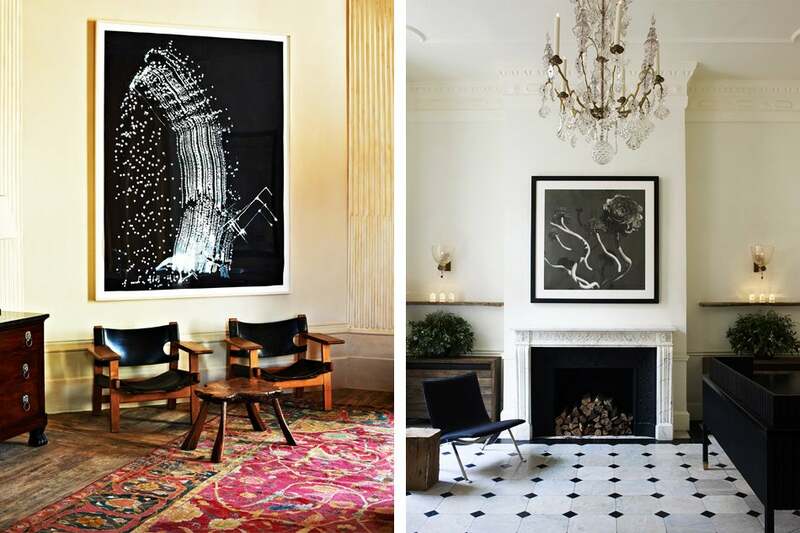 Take a tour of the perfectly curated residences that British aesthetic arbiter David Gill shares with his partner, interior designer Francis Sultana.